For a world without waste! Our mission is activation, motivation and cooperation of individuals, communities, policy makers, industry, businesses and researchers in the area of an efficient use of natural resources with the aim to reduce costs, preserve energy and create new green jobs. We educate and build opportunities for waste prevention, separate collection, recycling and composting of materials in waste. 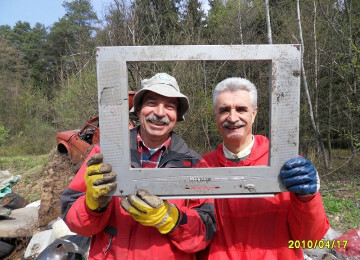 Let's clean up Slovenia in a day! There is only so much work and energy one can fit into a day, while on the other hand the need for environmental change is still rising. Come and help us catch up! We are looking for volunteers in various topical areas, so check out the next few tabs and shoot us an email. We are seeking help from designers to enrich our messages and open new channels. If you can draw, paint, edit, do video; web, service or game design, you can make a difference. Modern technology is a bottomless well. Come and help us drink from it. Our uses center around web, GIS and OpenData, so if you can code or analyze, come and join our team. Much of our work relies on efficient and meaningful communication. If you have a knack for storytelling or research, let us know! Awesome, we hope you're having a blast! Let us know if you want to meet or help with our real-life events. We also regularly mentor students from a variety of countries. Let us know if you have anything special in mind. If you don't identify with any of the above, you can always help us by promoting our work and/or donating. Ecologists without Borders is a non-profit founded in 2009 and one of the leading Slovenian NGOs dedicated to improving the state of our environment — focusing on efficient resource use and active citizenship. Most of our activities deal with waste at its source, but not all are limited to Slovenia. We're an active member of Zero Waste Europe, Let's do it world!, Break Free From Plastic and some other networks. Together we can move faster, come and join us! Towards a world without waste! Copyright © 2019, Društvo Ekologi brez meja. All rights reserved. Two campaigns that are still considered the largest volunteer events in the history of our nation. We managed to connect 289.000 (or 14% of the population) of individuals, businesses, NGOs, Slovenian army, police, municipalities, and even President’s office, who later decorated us with the order of merit. Joining great efforts from Estonia, we managed to convince activists from several countries to start similar initiatives for the World Cleanup 2012 campaign, most notably in the Balkans. More than 110 countries have since participated. In 2018, we're doing it again as part of World Cleanup Day, together with 130+ countries on the same day, September 15th. Want to become part of the story? Write to us! We are a national organization of the Zero Waste Europe network. We promote the concept, organize best practice visits and convince municipalities to adopt Zero waste plans. The list includes Ljubljana as the first such European capital. Our aim is to eventually adopt a Zero Waste strategy on the national level. In the past few years, Slovenians managed to recycle 55% of their municipal solid waste, some communities even up to 80%, which made Slovenia one of the best performing countries in the European Union. Some local communities in Europe recycle and compost over 90% of their waste - or very close to zero. Such incentives are becoming a part of EU development strategies, which set the goal of a totally recycling society, a circular economy and the efficient use of natural resources. With our help, first Slovenian municipalities decided to follow the path towards Zero Waste. Actions speak louder than words, so we have implemented several waste prevention campaigns. They range from accelerating textile reuse and recycling, food waste prevention across the whole chain (including hospitals), green tourism, humanitarian waste paper collection, throwaway bag use reduction, to promoting use of reusable cups and diapers. To reach our vision of a healthy environment and resource efficient economies, we need two things: to believe that this is possible and your support to enable us to plow through. Donations enable our independence, help cofinance international projects and give us a chance to work on mind-numbing-but-necessary projects that are otherwise hard to fund.